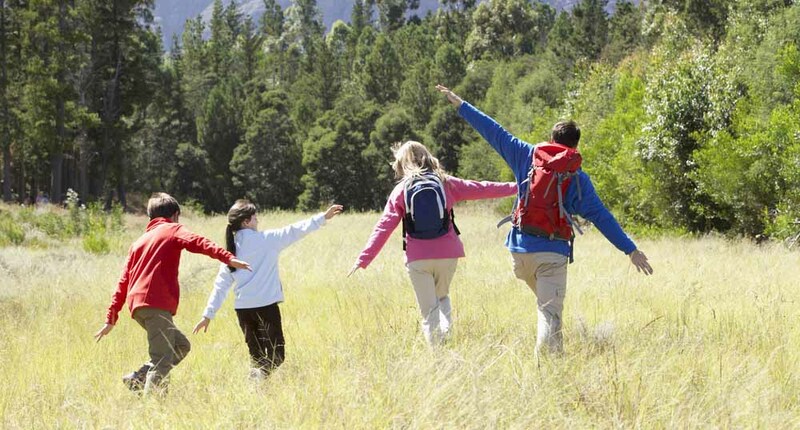 Camping is one of the best outdoor activities you can experience, but obviously, you still have to eat. Of course, you can bring cold cuts and loaf bread for sandwiches, but there's no reason why you can't indulge in a hot meal, either. 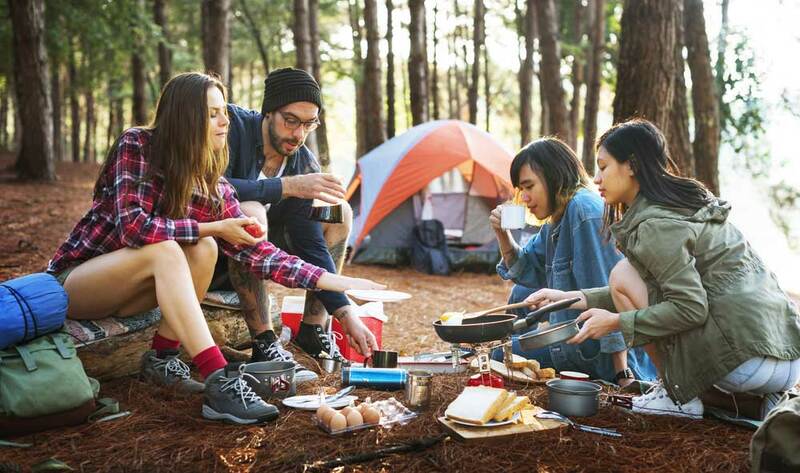 There are several ways of cooking while camping and at least one of them will be right for you and your family. First of all, if you plan meals ahead of time, you can already have meats marinated, potatoes wrapped, and vegetables cut. That way, everything you need is in one place. Also, you should have a separate cooler for raw meats. You can buy one of those cheap Styrofoam coolers for a couple of dollars. You should always store raw meat and ready-to-eat foods separately. 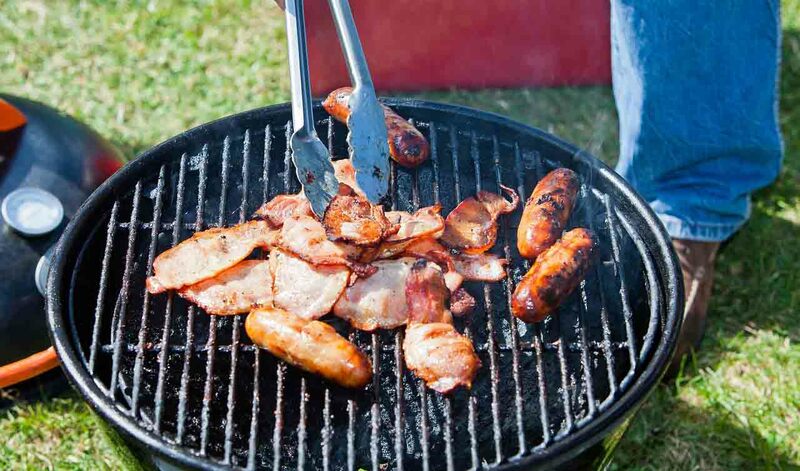 As for cooking while camping, you have basically three choices. The first is by cooking over an open flame. 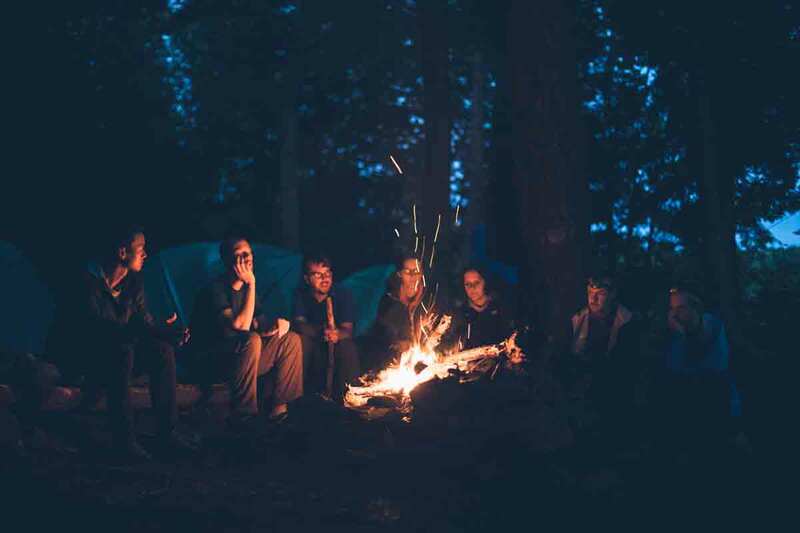 Most often when camping you have a campfire; it's just part of it. If you do, you can use it to cook over. You'll need a rack for the food to cook on and aluminum foil if desired. 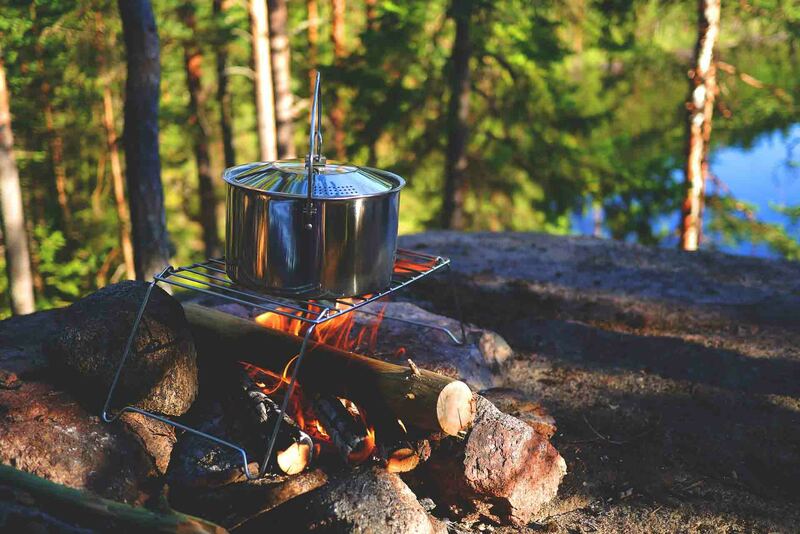 You can find a rack specific for cooking over a campfire most anywhere camping supplies are sold or you can always use the rack out of your stove. You'll also need a couple of large rocks to prop the rack up over the campfire if your rack didn't come with legs. 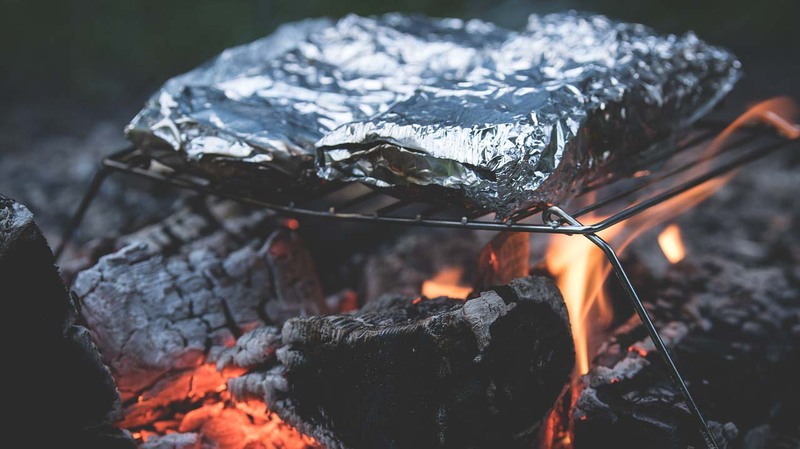 You can roast potatoes and corn on the cob directly in the coals if you wrap them with aluminum foil first. The best way to fix either is to spray vegetable oil to coat and then sprinkle salt and pepper to taste before wrapping in aluminum foil. Throw the covered veggies in the coals and cook 45 minutes to an hour, depending on thickness. (Don't forget to bring tongs if you're going to cook this way!) Once your campfire is going well, place the rack on it's legs or the rocks over it. Place it close enough to cook the meat well, but not directly in it. You can cover the rack with aluminum foil if desired; it helps to keep the rack cleaner if you plan on using it multiple times. Use tongs to turn meat while cooking. Most importantly, be careful!! Pay close attention to food cooked over or in an open fire. All you need is a rack and some rocks. To make a grill, first make a square of rocks about a foot wide on each side. Then, if you want air to circulate, stack additional rocks at the corners for the rack to sit on a few inches above the charcoal. Place charcoal in bottom square and light. When the charcoal is ready, place the rack over it on the elevated rocks and you are ready to cook. Again, use aluminum foil if desired; it helps keep the rack clean for multiple uses. The last way of cooking while camping is to use a propane operated stove. Varieties of these can be found in the camping isle of Walmart, in any outdoor adventure stores, such as Bass Pro Shop, or online. The types and sizes vary, but they are all easily maintained and very easy to use. Basic stoves have two gas eyes that can both be utilized at the same time using the same propane tank. (Cookstoves can use the small cans of propane.) Simply set the stove up, hook up the propane, turn gas on, light stove eyes, and viola! Cook just like you do at home. If you're a meat lover, try thin sliced pork chops marinated in Ken's Honey Mustard is a delicious way to cook them while camping. They are just as tasty cooked any of the three ways. If you're a vegetarian, try grilling vegetable kebabs marinated in the honey mustard. It really depends on what type of cooking you plan to do as to which method you choose to use. All are fairly simple and will give you a nice hot meal. It's really just a personal choice. Try all three and see which suits you and your family's needs best. A bit of advice: make sure all fires are out before bed, including charcoal. If a grill is still smoking, make sure it is covered to keep ashes from being blown out and potentially starting a fire. It's best if they are completely put out. If you're using gas, double check to make sure gas is turned off. By unhooking the propane after cooking, you ensure there won't be any leaks. Have fun cooking while camping! Be safe, have fun, and don't forget the S'mores!